Oh my,look at those smiling faces. There was a time in American Air Travel when travelers could freely pack their Samsonite’s to the max. With the exception of a Briefcase or Make up bag, no one brought their bags on board the plane. They could arrive and hour before their flight, check their bags at the ticket counter and sit on seats wide and comfy enough for Aunt Katie. 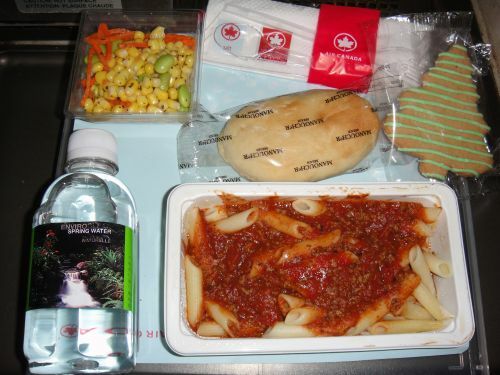 In the air, they had snacks and meals that rivaled the best blue plate special at Woolworth’s. Is that meatloaf and potato’s? yum ! A few years ago, the airlines began charging for baggage. They said they needed the surcharges to offset rising fuel costs. As a result many people brought their baggage on board with them. The airlines have always had carry on restrictions, but rarely enforced them. However that is changing. Last March United Airlines revised its carry on policy. Its previous policy was that no dimension could be over 22 inches and the total overall dimensions no more than 45 inches. 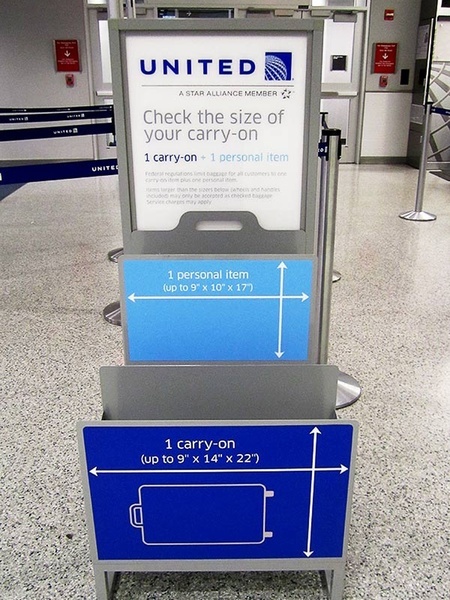 Today to qualify for a carry on, the maximum dimensions of your bag is 9X14X22. American and Delta has updated their carry-on bag policies, including a 14-inch maximum width, So these very specific measurements really change the game, and will be causing a lot of anger and even more headaches at airports nationwide. It’s interesting that not all airlines have the same size limits. Southwest and JetBlue have a more generous 24 by 16 by 10-inch carry-on limit. for now. American Airlines,Delta Airlines, and United(Continental) controls over 50% of domestic Market. Forgot to includes those shoes and your able to zip the bag. If those shoe protrude, and does not easily fit in the bag sizer, you’ll have to pay for baggage. If your travelling on American,Delta, Spirit and United allow extra time. The enforcement of the new rules will delay many passengers. Some will miss their flights entirely. 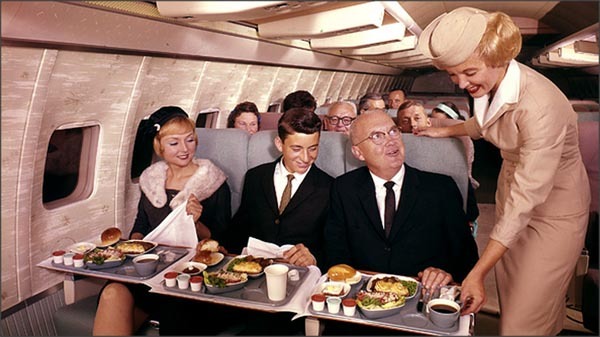 Remember those happy people, this is the New World Order in airline travel. (Using a deep authoritative voice) Well son Woolworth’s was one of the first discount stores, back in the olden days we called them five and dime stores. They were in nearly every city in the country… The bigger stores had lunch counters where you could order breakfast lunch and dinner. The world changed and Woolworth closed. The name lives on in Australia, New Zealand and other countries. Dad ,why they call them lunch counters if they served breakfast and dinner? Son, that’s a good……. Is that the new Iphone 6? Ok what is the blue plate special? Son,I will have the check Wikipedia for this one. This entry was posted in Air Travel, Enonomics, Humor, Just Sayin, Living Here, NATIONAL, Sacramento International Airport and tagged American Airlines, Bag Sizer, Blue Plate Special, Carry ons, Delta Airlines, Jet Blue Airlines, Southwest Airlines, Spirit Airlines, United Airlines, US Air Travel, Woolworths. Bookmark the permalink. ← Buy A Buick Regal over a BMW 328 or Mercedes C250? Consumer Reports Say’s Yes! You have an unique blog. The only complaint I have is structure and you need to proof raad. Having said all that, Sacratomatoville (wonder what’s behind the name?) always interesting. Thanks Delandra, we are a work in progress.